bread. In humanity, the history of bread is the history of nourishment, as it was essential for health, and this, in turn, is the history of wheat and other grains. The leaven bread known today is from the Egyptians who first discovered fermentation produced with yeast by chance and they created the first ovens. Bread was basic nutrition for the poor and luxury for kings. It was an indespensible product. A meal was inconceivable without it. It was used to convey solid ingredients to the mouth and to sop up liquids. For Christians it is ‘Christ’s body,’ the host or the wafer. Jews offer the first grains from the harvest to God. The finest bread was made with soft wheat (T. aestivum), which is the result of hybridization of cultivated emmer (T. dicoccum) and a wild grass, Aegilops squarrosa. It is thought that this happened between 6000 and 5000 BC. By 200 BC at least grindstones were used to make flour but until 1700 milling technology was primitive. Sieves were not improved. The result was much coarser flour than that known today. Further, it was impossible to grind hard wheat flour to be fine enough for bread baking as it is today. At first flour was served raw in the Neolithic era. Gradually methods were found to cook it, which required structural modifications with the addition of water changing it into paste or dough. With this evolution, bread was baked with yeast or without. 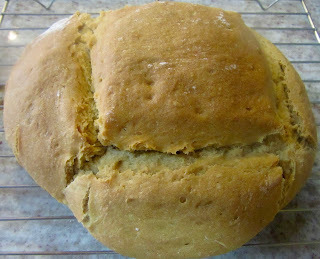 The gluten and the fermentation together with the inclusion of sugar became a light dough or digestible bread. For the gluten content, it was added to soups in which breadcrumbs were boiled or toasted. In the 8th C. breadcrumbs were dipped into melted lard. By the 10th C. sesame, salt, cumin and cinnamon were added in Al-Andalus. Bread varied in geographical areas and according to cultural tastes, which make bread a culinary art. Syrians baked bread under the coals while others used ovens. The evolution of fritters made bread a member of “fruits” from the frying pan. Andalusians included it in casseroles and baked it in the oven as the Romans, who liked soggy bread, or cooked dry with a little water. There were an enormous variety of ways and forms of making bread including stewed bread, bread filled with dried fruits and bread with seeds and spices. Berbers of the 12th and 13th C influenced Al-Andalus dishes. They mixed bread and cakes with milk, honey and lard and added it to Andalusian soups. Further, the quality of bread consumed was connected to the social and religious classes. The poor ate bread made with grains of poor quality while the rich had white bread rolls. As bread was vital in all meals of all people during the Middle Ages, in Spain, wheat famines caused unrest and rebellions. See mollete. Surviving medieval bread recipes in Spain are from the Hispano-Arabs and are for flatbread not loaves. Four recipes are available in Fadalat and a half dozen in Anón, Al-Andalus. 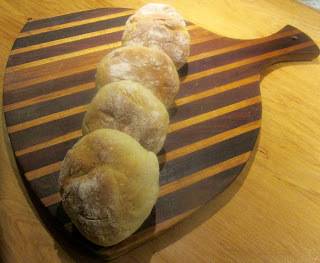 Jewish bread recipe survive from the Middle Ages in Iberia. "Halo bread," an egg bread, was specially prepared for the Jewish Sabbath. This is a round or braided loaf of Jewish bread which may have raisins inside. The Hebrew word refers also to the portion of dough reserved for the rabbi. In general, loaves of bread were round during the Middle Ages. 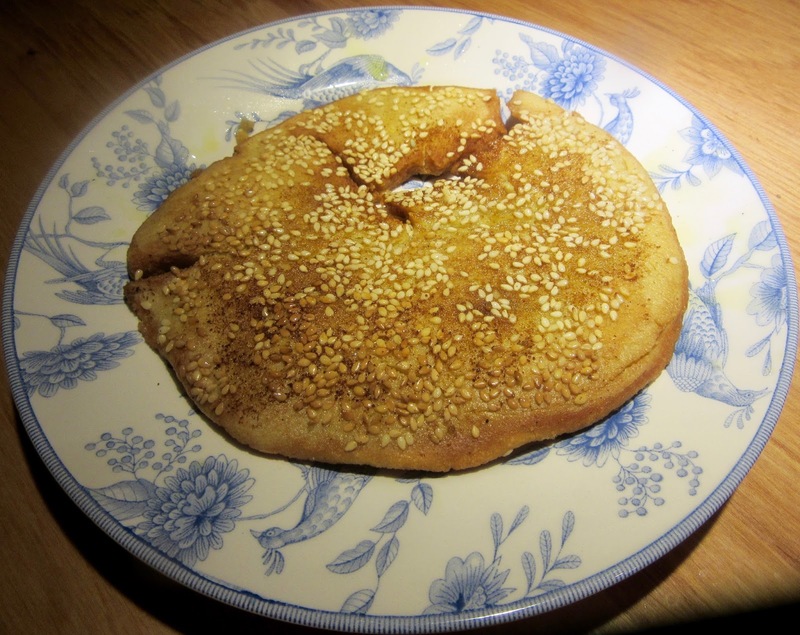 Hispano-Arabs also made halo bread and baked it under the ashes, not in an oven. In Granada and Cordova, a round loaf was made that looked like a diadem or halo. The Cordovans baked this cake especially for the New Year. The process of baking bread under ashes was not an invention of the Arabs, who invaded Spain in the 8th C, for it is mentioned four times in The Bible (Kings XIX:6, Lev II:5, Ezek IV:3 and Chron IX:31). 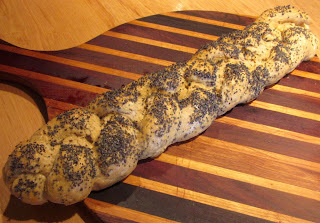 It could have been a method handed down from the Egyptians, supposedly the first bread bakers. It could be made with or without oil. 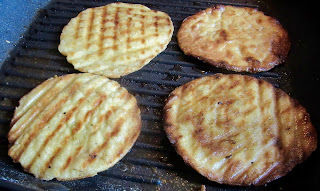 Jews, normally, made it unleavened, except for the Sabbath. Search for "bread" in The Medieval Spanish Chef's blogs for numerous recipes for breads. Mix the semolina, dry yeast, baking flour and salt. Make a well in the center. Fill that with lukewarm water. Beat until smooth. Knead 5-10 minutes. Cover and set aside in a warm place for one hour or until double in size. Flour a surface and roll out dough. Cut the dough into circles about 4" in diameter. Roll each circle out again to make the circles wafer thin. 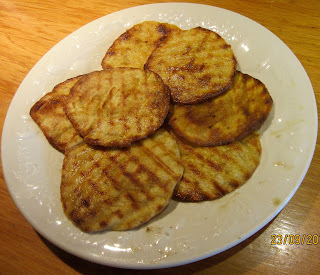 Preheat a griddle or frying pan over medium high heat. When hot, brush the wafers with oil. Cook each wafer for about two minutes until golden brown underneath. Brush the top of each wafer with oil and flip it over. Cook on the other side until golden brown. Remove from the griddle and repeat the process with the remaining dough until used up. The recipe does not call for garnish but as the wafers are like crackers but any kind of toping can be permitted from cheeses to caviar or patés. Marin translates the Arabic word malla to hot plate. Actually, malla means hot ashes but those without available wood fires today would use a hot plate or burner.